Something Awesome (#4, outside) was narrowly best in the 2018 Grade 2 Charles Town Classic. Photo by Coady Photography. Pletcher, who won the 2016 Charles Town Classic with Stanford, equaled his nomination total from 2018 with the most noteworthy being 2018 Louisiana Derby (G2) winner Noble Indy and 2018 Wood Memorial (G2) victor Vino Rosso. 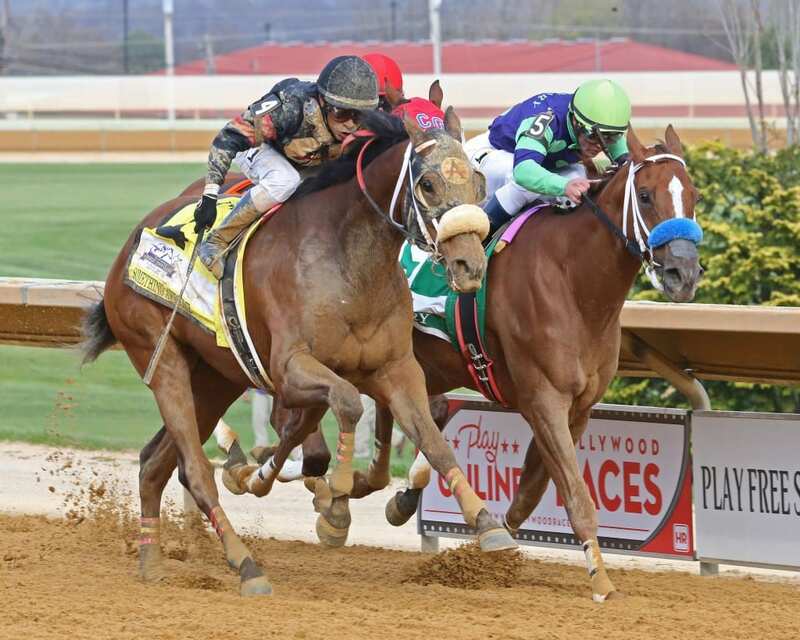 Much like his East Coast rival, Baffert would be seeking his second victory in West Virginia’s richest race, having taken the 2013 edition with Game on Dude, to go along with the popular gelding’s runner-up efforts in 2011 and 2014. The Hall of Fame trainer is represented by multiple Grade 1 winner McKinzie, who is expected to start in Saturday’s Santa Anita Handicap (G1), as well as Dabster, 2018 Californian (G2) winner Dr. Dorr, recent allowance winner Nero and Grade 1-placed Solomini. Outside of McKinzie and 2019 Dubai World Cup starter Seeking the Soul, the other Grade 1 winner in the Charles Town Classic nominations is Discreet Lover, best known for his 45.50-to-1 upset in the Grade 1 Jockey Club Gold Cup over two-time Dubai World Cup champion Thunder Snow. Off since the 2018 Breeders’ Cup Classic (G1), the now six-year-old owned and trained by Uriah St. Lewis shows a series of works at Parx as he readies for his 2019 debut. A pair of past champions also appear in the nominations in the form of defending champ Something Awesome, beaten five lengths in his most recent title defense in the General George (G3) at Laurel and Imperative, who won the race in 2014 and again in 2017. Imperative is one of seven nominees for trainer Anthony Quartarolo, all of which are owned in whole or in part by Ron Paolucci, while Something Awesome will attempt to match Researcher’s feat of winning the Charles Town Classic in consecutive years. Nominations for three additional unrestricted stakes all run at 7 furlongs – the $100,000 Dance to Bristol for fillies and mares four and up, the $100,000 Robert Hilton Memorial for three-year-olds, and $75,000 Russell Road for three-year-olds and up – close this Saturday, April 6.